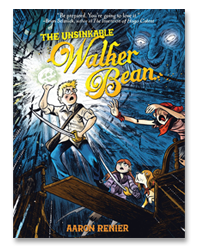 "Anyone who has said that pirates are an overused motif in youth literature has not yet met Walker Bean." "Renier’s tale is a youngster’s dream: adventure with a capital A. " This rip-roaring tale of swashbuckling adventure from the Eisner Award winning Renier offers up a story line and art of equally intriguing depth. It is colonial times, and Walker Bean must help his grandfather, who’s been cursed by a pair of witchy undersea lobster-women named Tartessa and Remora, by returning a magical skull to the mysterious Mango Islands. Stowing away on a ship, Walker teams up with a dog named Perrogi (obviously drawn with the affection of a dog lover), a boy named Shiv, and a tough-talking girl named Genoa. Renier’s dynamic drawings are rich in detail; readers will get lost in the winding streets of colonial towns, island hideaways, natural history collections, exuberant panoramas of action. Renier lets his imagination lead the way, throwing maps and illustrated clues throughout this seafaring world, and setting up all manner of surprises and danger for Walker. Among the pleasures of this graphic adventure novel are the scene-stealing “evil merwitch sisters,” who appear in the first pages with snaggleteeth and glowing eyes, snipping their prey in half with lobster claws. Please, tell us more. Walker Bean, an intrepid lad on a mission from his grandfather, must outwit the merwitches, not to mention a cackling skull in a sack. The action is occasionally confusing and the cast a touch overcrowded, but this is an authentically exciting seagoing yarn in graphic form and there should be more like it.